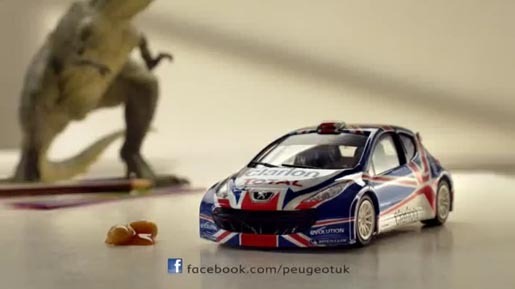 Peugeot UK is promoting the Peugeot 207 S2000 rally car in “Child’s Play”, a television commercial connecting the rough and tumble of children’s automobile play with the challenges of the rally. 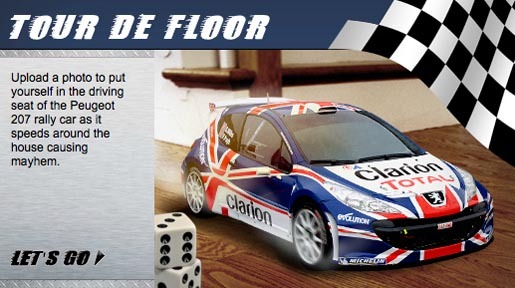 The ad connects viewers to “Tour De Floor”, an interactive experience on the Peugeot UK Facebook page. Visitors to the site enter the race around the house by uploading a photograph and entering a name. The Child’s Play ad was developed at Euro RSCG London by creative director Dominic Gettins, copywriter Harry Stanford, art director Mike Insley, agency producer Jodie Sibson Potts. Filming was shot by director Charlie Crane via Knucklehead, London, with producer Darren Tuohy and director of photography Richard Stewart. Editor was Eve Ashwell at Final Cut. Music is “Only Playing”﻿, performed by “Charlie / I”.